The Chemnitz case shows a Saxon city where the radical right has tried to establish itself for years, with some very concrete fantasies about a violent ‘overthrow’. 21 September 2018, Saxony, Chemnitz: Right-wing populist movement 'Pro Chemnitz' marching through the city. Press Association images. All rights reserved. In late August, the east German city of Chemnitz startled observers from all over the world. On 26 August 2018, 35 yr.old German Daniel H. was stabbed to death after a quarrel had escalated at a city festival in Chemnitz (Saxony). Shortly afterwards, the police arrested two asylum seekers from Syria and Iraq as the presumed perpetrators of this crime. Although the victim was neither a member of the radical right scene nor known as a sympathizer to any radical right organisation, neo-Nazis and hooligans misappropriated the crime to instigate violent mass demonstrations and riots in the following days and weeks. They were joined by the radical right party Alternative für Deutschland (AfD). The events brought to the surface what the radical right in Germany is capable of, once operating jointly, while police forces were visibly overchallenged. The events brought to the surface what the radical right in Germany is capable of, once operating jointly. Furthermore, the radical right mobilization of Chemnitz affected the ruling coalition of the SPD and CDU/CSU in Berlin. The appraisal of the events caused a governmental crisis among this already beleaguered coalition. It eventually led to the removal of the domestic intelligence chief, Hans-Georg Maaßen from his post, after he incorrectly labelled the coverage of the racist assaults, “fake news”. 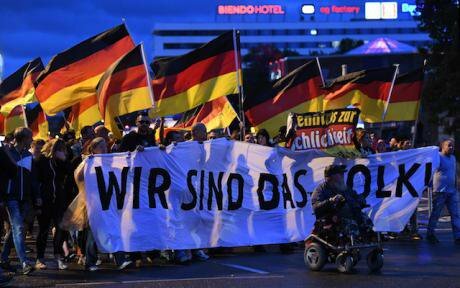 For well-versed observers, the radical right marches of Chemnitz did not come as a surprise. Saxony has been the site of numerous far-right mobilizations over recent years. To understand the dynamics of these events, it is important to analyse the radical right narratives that came into effect in Chemnitz. Furthermore, it is crucial to embed these neo-Nazi actions into their historical context. Journalists and eye witnesses have documented how participants in the neo-Nazi demonstrations hunted down and assaulted immigrants and left-wing activists, attacked a Jewish restaurant and publicly called for murder. The instrumentalization of a real or a supposed capital crime, committed by a ‘foreigner’ is a popular resource within the radical right scene as it works well to inflame racist sentiments and fuel fears. As the Chemnitz case shows, the concerns of the victims or their relatives meanwhile do not matter. Racist rioting has an almost 30-year history in Germany: In August 1992, rioters attacked an asylum hostel in Rostock-Lichtenhagen (Mecklenburg Hither-Pomerania), while several thousand bystanders applauded them. As in these assaults, neo-Nazis and local residents attacked refugee hostels in Hoyerswerda (Saxony) in 1991 and Mannheim-Schönau (Baden-Wuerttemberg) in 1992. More than twenty years later, in August 2015, hundreds of violent rioters besieged a recently-opened refugee hostel in Heidenau (Saxony). These sieges also lasted for several days or night in a row, with the police only hesitantly putting an end to them. These sieges also lasted for several days or night in a row, with the police only hesitantly putting an end to them. Given the fact that similar mass violence has occurred in the past, the radical right movement can be characterised by cyclical recurring mobilizations, David Begrich says, who is an expert on the radical right in Eastern Germany. He and other scholars stress the relevance of the “Generation Hoyerswerda” generation of neo-Nazis who experienced the early 1990s’ racist riots as an expression of significant political potency. That narrative not only had its impact on activists who were politicised 25 years ago, but it underwent a mutation that also allowed it to appeal to later generations. Alarmingly, more than 6.000 far-right protesters marched through the city of Chemnitz only one day after the murder incident. The radical right’s capability to react so quickly has astonished many observers. Credit for this can be laid at the door of social media and advanced communication technologies. But it was also the further consequence of a certain ”permanent propaganda from the far right” Saxony has been seeing for years, as sociologist and head of the Institute for Democracy and Civil Society (IDZ) in Jena, Matthias Quent put it. Saxony is the homeland of the radical right Pegida demonstrations that have frequently been able to convene thousands of participants since 2014. Additionally, between 2000 and 2010, the capital city of Saxony, Dresden, was the site of one of the largest far-right demonstrations in Germany with up to 7,000 participants remembering the bombing of Dresden by the Allies on February 13, 1945. Since 2013, the radical right in Eastern Germany has significantly extended its regional and political range. In addition, the rise of the AfD has made far-right positions widely socially acceptable. The rise of the AfD has made far-right positions widely socially acceptable. Saxony is a region in eastern Germany that combines a well-connected and experienced neo-Nazi scene on the one hand and a high approval rate for radical right parties on the other hand. At the federal elections in September 2017, the AfD reached 27 percent of all votes in Saxony and became the strongest party, even ahead of the Conservative Party. For the different factions of the radical right scene, the violent demonstrations in Chemnitz were a cause for rejoicing. Their comments and statements told us much about current far-right self-conceptions. Many activists consider themselves to be in a civil war fuelled by “(Muslim) foreigners” and approved by the government as the far-right blog “journalistenwatch” put it. But also the notion of a ‘revolution’ was widespread, even including positive invocations of the Nazi period. For example, an AfD county council faction in Hesse wrote on its Facebook page: “During revolutions known to us the broadcasting studios and the publishing houses were stormed at some point and the employees were dragged into the streets. This is what media representatives should once reflect here in this country since when the mood is changing eventually it is too late.” This post related to the violent suppression of the free press in 1933 after the National Socialists had taken over power. This post related to the violent suppression of the free press in 1933 after the National Socialists had taken over power. The imagination of a ‘people’s uprising’ can also be traced to the popular narrative that eastern Germans had won out over the GDR government in 1989 and that the people in eastern Germany are in a similar situation today. In eastern Germany, the radical right milieu shares the collective storyline of overthrowing a political system – a regime change that can be repeated again, as Begrich says. A chorusing of “Wir sind das Volk” (“We are the people”), adopted from the 1989 Monday demonstrations, is frequently heard on Pegida and other radical right demonstrations for example. These narratives can be revived whenever the occasion seems convenient. The Chemnitz case serves as an example of a Saxon city where the radical right has tried to establish itself and to maintain hegemony for years. With the demonstrations in late August and early September, the scene that opened up was not only well organised and spontaneous at the same time, but it has also brought to light the fact that many far-right activists and sympathizers have some very concrete fantasies about a violent ‘overthrow’.